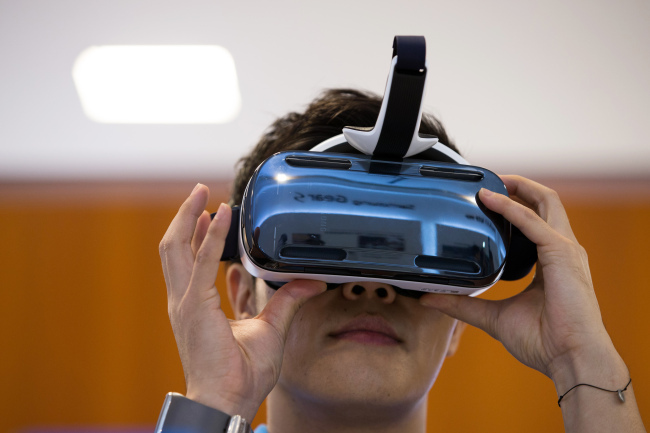 Samsung Electronics is said to be investing in virtual reality game developers to boost its fledgling VR business amid sluggish smartphone sales, industry sources said. The South Korean tech giant’s move comes as it needs to create an ecosystem for the Samsung Gear VR, which could be released as early as next month, by financially supporting and encouraging software developers to make game content. “Samsung is making investment in game companies with great ideas and content for the headset,” said a source close to the matter. The source noted that his own game company was also planning to make one for the digital headset. There are about three Korean companies that are preparing to launch VR games in the near future, while social network giant Facebook’s Oculus, with which Samsung partnered to develop the 3-D VR headset compatible with the Samsung Note 4, has established ties with Korean game content providers, another source said. The Gear VR was unveiled at the IFA electronics trade show in Berlin last September. However, given that most of the games are still being developed, it will take some time for them to hit the market. Samsung could also be looking to invest in overseas VR game companies in an effort to spur the virtual hardware, a source said. A host of companies worldwide are developing virtual 3-D games for the VR device, to be rolled out next year, after the headset is released. U.K. developer nDreams, which used to work with Sony for VR games for the Playstation console, unveiled last September its first VR games ― first person shooter “Gunner,” and “Perfect Beach,” an experience application enabling users to feel like they are relaxing on a beach. Analysts estimated that the Gear VR could create a $7 billion market in four years. “The Gear VR has great potential for game companies since the new device could bring a new user experience to gamers,” said an industry source. However, Obstacles remain for Samsung as the gadget has a relatively low display resolution, which could make the virtual experience less vivid.